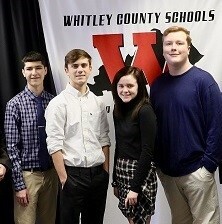 Whitley County High School juniors Morgan McKiddy, Blake McCullah and Conner Wilson are taking part in an exciting pilot program that aims to teach high school students IT skills. The two year, paid apprenticeship opportunity is provided by Dataseam, a company based out of Louisville. Whitley County juniors will work under the tutelage of professionals to maintain, configure, install, repair and troubleshoot computer, network and software at their schools. In addition to teaching applicable IT skills, the program intends to serve as a precursor to potential careers in the space science, state or local government, banking and ﬁnancial services. According to Dataseam CEO Brian Gumpton, the U.S. Department of Labor, the Kentucky Education and Workforce Development Cabinet and the Kentucky Labor Cabinet approve of the pilot program. “These are industry standard certifications. They are not the end all be all. You often, in IT, have a set of what’s called stackable credentials. As technology is always changing, each of these certifications in different areas continue to build upon one another,” Gupton said. The highschool students are set to graduate with real work experience and marketability based off the credentials obtained in the program. With the increasing need for IT experienced professionals in a variety of business sectors, the pilot program could prove to be a valuable asset for employers seeking qualified IT candidates. There are plans to expand the program in the near future.